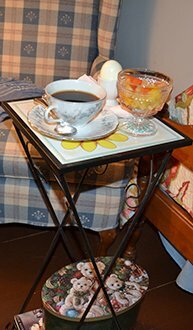 Step back into the “good ol’ days” and relax in our comfortable restored 1840’s house within Jonesborough’s Historic District. 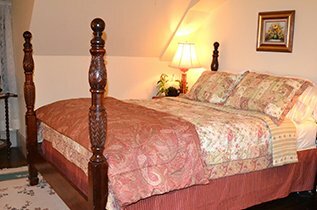 Our inn is only two hours from Knoxville, providing a quick and easy weekend getaway from the hustle and bustle of the city or a fun-filled Tennessee vacation. Sit on our front porch rocking chairs and take in the refreshing breeze and the view of trains as they rush by. Our clean and cozy accommodations include three charming rooms and a "home away from home" guest apartment. Enjoy a delicious full breakfast with your hosts and other guests in our dining room. Snacks and beverages are always avaliable for your convenience. Franklin House has wireless internet throughout the inn. Just a short four-minute walk to the center of downtown, you can experience warm southern hospitality and prepare to re-visit the past by touring, shopping, or taking in the sights of Tennessee’s Oldest Town. With the scenic Cherokee National Forest just minutes from our inn, there's sure to be a little something for everyone. The innkeepers will share their wealth of information about the area to help plan your trip or vacation to Tennessee or North Carolina. Celebrating 17 years in business! 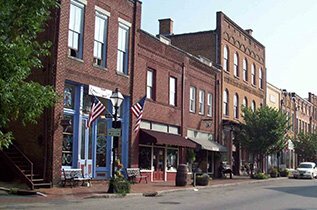 Born and raised in New Jersey, we began to visit Jonesborough in 1982 for the Storytelling Festival and became enamored with the town and its residents. We bought and started restoring an 1840’s house in 1990 and became full-time Jonesborough residents in 1995, officially starting Franklin House Bed & Breakfast in 1997. 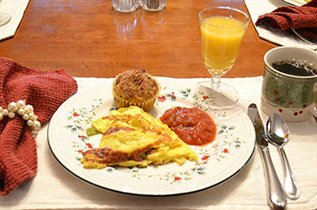 We look forward to having you stay with us and enjoy our home in Jonesborough and our delicious full breakfast.